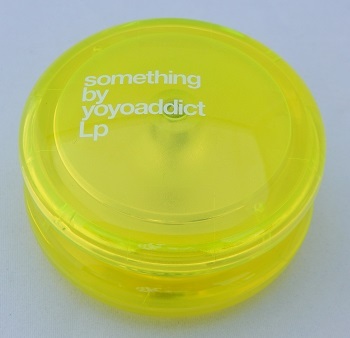 Something by YoYoAddict's sophmore release of the "Lp" intended for 2A (looping) play. Like most 2A-type yo-yos, this model uses original response by way of a starburst that is molded into the body halves. What is great about this yo-yo is its superb balance for out-of-the-box play; no special gap adjustment, bearing lubrication, or pad maintenance is necessary. Uses a size K bearing. Each Lp is assembled by hand and then tested by World 1A Champion Hiroyuki Suzuki before they are shipped to stores. The spacers near the axle are made from high-performance DuPont Delrin--also known as polyoxymethylene or POM. This high-performance resin helped Something create spacers that have low friction and excellent wear resistance, ensuring better and more consistent yo-yo performance over the use of traditional plastic and metal spacers. Originally, sOMEThING teamed up with 2A World Champion Takuma Yamamoto and SJ Looping Champion Tomoyuki Kaneko to create this yo-yo. The recommended string to use with this yo-yo is sOMEThING's Neon String (Type 2) or Type 6 (50/50). Original retail price: $28 US.